Harmony of the Seas ~ Largest Cruise Ship in the World! 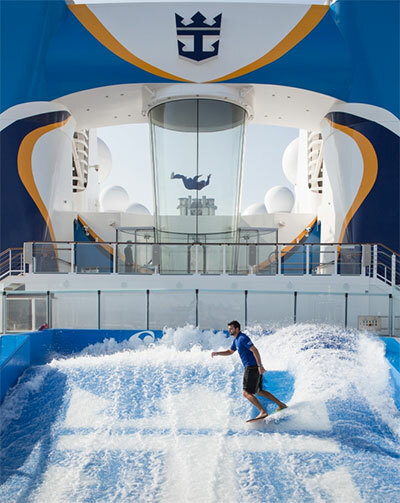 Royal Caribbean are known for having the largest ships in service, constantly outdoing themselves with first-at-sea experiences and they have done it yet again. 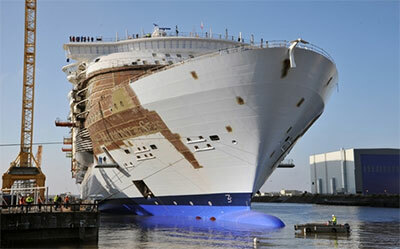 On Friday the Harmony of the Seas was floated for the very first time in waters off western France, showing that it was on track for the first voyage from Southampton to Barcelona next May. The mega cruise ship will weigh 227,000 tonnes, measure 362 metres in length with 16 guest decks with 2,394 crew members to serve approximately 5,488 cruisers. The construction of the Harmony has required over 2,500 people, 90,000 square metres of carpet and 500,000 litres of paint. 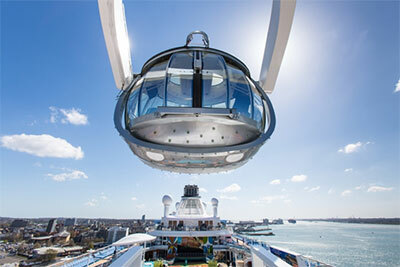 Harmony of the Seas boasts first-at-sea experiences such as the RipCord by iFly, a skydiving simulator, North Star, a jewel-shaped capsule that ascends over 300 feet above sea level giving you 360° views of the sea and destinations and the Bionic Bar, featuring robot bartenders. To keep the whole family entertained, the Harmony also features two FlowRider surf simulators, two rock climbing walls, an ice-skating rink, mini-golf course, a 24.9 m zip line and three multi-storey waterslides! Spectacular Aqua Theatre shows, ice shows, the DreamWorks Experience, live jazz club, karaoke bar, salsa dancing and a comedy club are just a few of the other entertainment options onboard to make your stay onboard a one-of-a-kind experience. Dynamic dinning onboard the Harmony gives you more flexibility with no set dinning times, no assigned seating and no required formal nights. With over 20 dining options, cruisers are spoilt for choice with everything from food truck style hot-dogs and Johnny Rockets to Jamie’s Italian and Samba Grill Brazilian Steakhouse there will be something for everybody, even the fussiest eaters. With new cabin configurations, already available on some of the Oasis and Quantum Class ships, such as loft suites, interconnecting family rooms and studios for solo travellers, there are accommodation options to suit all cruisers. Book your spot on the Harmony before it sells out!